In an effort to supply clean energy to its production partners in China, Apple has signed a deal with Xinjiang Goldwind Science & Technology, the world’s largest wind power turbine maker. According to South China Morning Post, Goldwind’s wholly-owned subsidiary Beijing Tianrun New Energy Investment is transferring its 30% stakes in four project firms to Apple, as detailed in a Hong Kong stock exchange filing. While the filing does not indicate how much investment will be made by Apple, it did say that the project firms will become “cooperative joint ventures” and will no longer be consolidated in Goldwind’s financial statements, suggesting that important matters will “require unanimous approval by their directors”. Although, the firms, which are located in Henan, Shandong, Shanxi and Yunnan provinces, will remain subsidiaries of Goldwind under Hong Kong’s listing rules. “Apple is committed to powering all of its facilities around the world with 100 per cent renewable energy, and is now working with its suppliers to power Apple’s product manufacturing with renewable energy,” Goldwind said. Goldwind added the “aggregate consideration payable” by Apple was not significant enough to trigger any disclosure obligation. The cooperation, it said, will help realise its “direct supply and sales of green power”, enhance its brand awareness, and increase utilisation of its wind power facilities. 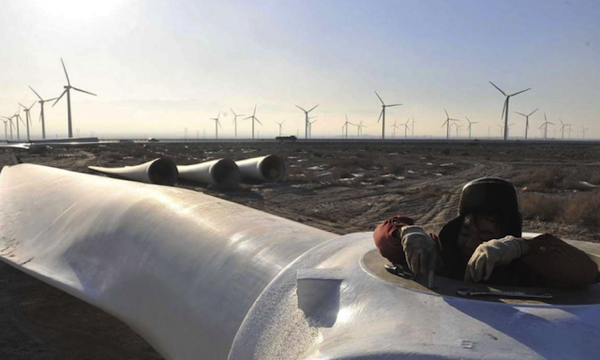 China is currently the world’s largest wind power market with 145 GW of wind farms installed by the end of last year.